If you've been a long time reader of Prairie Beauty Love, you'll probably recognize this travel makeup bag from the What's In My Travel Bag post I did around this time last year when I was heading out to Toronto to visit some family. I decided to get a little more intense with what I'm showing you guys this time around for my trip out to Orlando for a girls weekend at Disney World and Wizarding World of Harry Potter for one of my best friend's 30th birthday! On top of my makeup picks, I'm also going to show you guys the makeup brushes I'm packing as well as what I'm taking for skin, hair and body care! 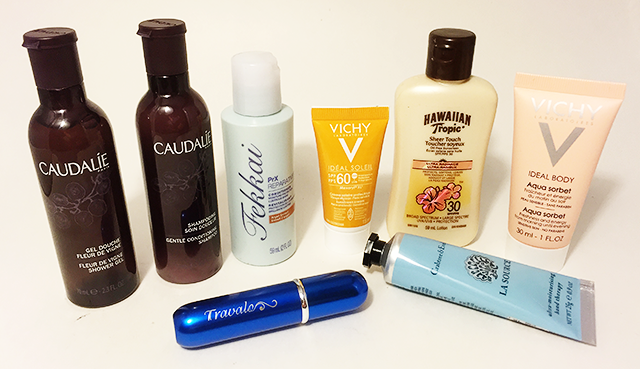 I've got some of my personal favorite products, travel essentials, and a whole lot of samples in the mix. 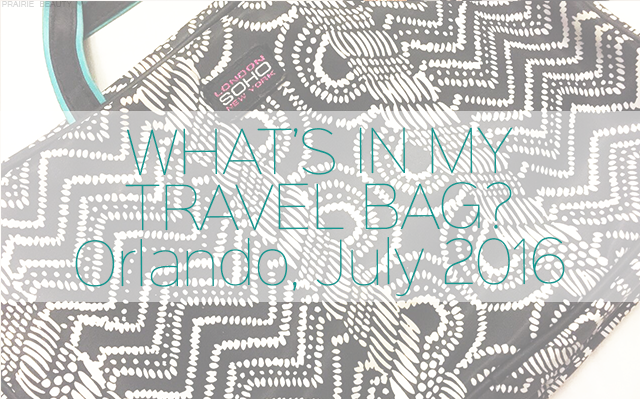 So if you're interested in seeing the contents of my travel bag, keep reading! I wanted something that was going to have everything I needed in one place, so I decided to grab this. 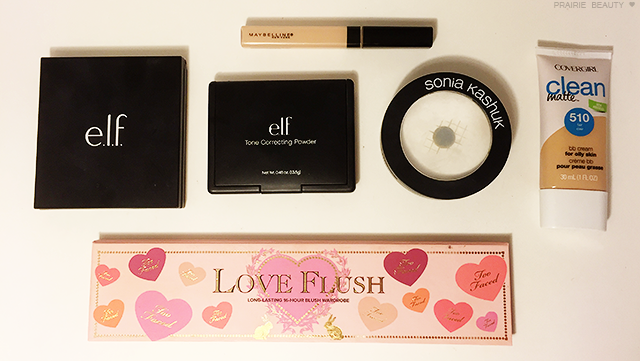 I've been using it recently and I love the tone of the bronzer on my current skin tone now that I have a touch of a tan, and I wanted the option of contour and a very subtle highlight as well. I use this powder as a finishing powder and I find that it's one of my favorite ways to just bring my whole look together and keep everything looking seamless. Honestly, this is also the only powder in my collection that the moment that hasn't hit pan or isn't convenient for travel, which is the bigger reason I picked it. There was no question that this would be coming in my bag. Though I use and enjoy other concealers, this is the one that I always go back to and the one that I'm confident being the only one I have with me. Know what I mean? Lately I generally set my eyes with loose powder, but I don't want to take loose powder traveling with me so I went for the next best thing and grabbed the Sonia Kashuk Chic Luminosity Glow Powder because I love the way it sets my undereyes and I can throw it in my bag for the theme parks in case I need a little touch up because the brush in the compact is actually very usable. I've been loving this BB cream lately because it stands up to the summer heat well on me, even though I do tend to perspire as well as get a little shiny later in the day. Because I'm going somewhere with high heat and humidity, I figured this was probably my best bet and I find it makes it well through long days - of which I'll have a few. No brainer. This is a great formula, it's got slim packaging, and it gives me all of the options I could possibly need for shades. If ever there was a palette in my collection that is perfect for travel, it's this one! This is my (now-discontinued) HG waterproof mascara and it was also a no brainer. I want mascara that's going to last through anything I could possibly put it through and still give me great lashes, so it had to be this one. 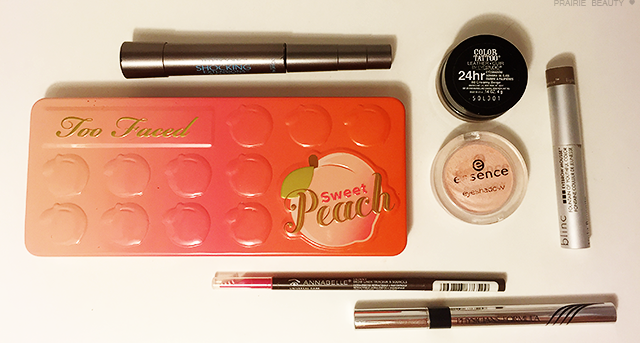 I went with Sweet Peach because it's a great summer palette to me, but also because it's the one I reach for to get my most basic, every day eye look recently and I figure it has everything I'll need for whatever I want to do with my eye makeup. And it smells yummy yummy yummy. For about the last month, I've been reaching for this cream shadow pretty much every single day to use as a base. Not only is it a great colour base for my go to look recently, but it keeps everything in place without creasing or fading for hours on end. I don't need any other eye primer as long as I have this. I'm actually bringing this along to use as highlighter in case I want something more glowy than what comes in the e.l.f. Contour Kit. I absolutely love this shade on the tops of my cheek bones to give some serious glow - and it's got smaller packaging than any of my other highlighters. This is one of my favorite brow gels recently, because I find that I can really get a decent brow look without having to fill in my brows - but it also works well to give texture and hold when I do fill in my brows. Also, it's incredibly long wearing and can stand up to many things. Admittedly, I actually prefer this pencil in the Universal Taupe shade, but I'm trying to get through a couple of others that I have before I pick up another one of those, so I'm tossing this in. It's easy to use, gives me really natural looking brows, and I like it a lot. This was an easy choice as well because it's my favorite go to for liquid eyeliner. I find that this really easily gives me a nice black line and lasts incredibly well throughout the day. What more could I ask for? I realize that the lips are missing and that's because I literally didn't pack anything other than what was in my purse already. So I've got the new Maybelline Color Jolt in Stripped Down, the Milani Color Statement Lipstick in Matte Naked, a NUXE Reve De Meil lip balm bullet, Kat Von D Everlasting Liquid Lipstick in Lovesick, and Burt's Bees lipstick in Blush. Also, there are going to be 7 Colourpop lip products waiting for me when I get there... Weeeeee! So... I'm taking a lot of brushes with me, but I tried to pare down and this was as few as I could bring myself to pare down to. Instead of getting too long winded, I'll just tell you what I'll use each brush for. I use this to apply highlighter. I literally use this brush every single day to set my under eyes. This is my all time favorite blush brush. 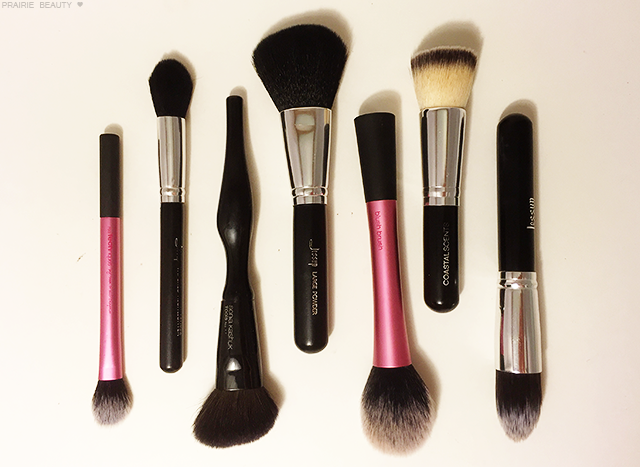 This brush is to set everything and also to apply finishing powder and blend my cheek products. This is my favorite foundation brush and I decided to skip a blending sponge because I don't want to deal with a wet sponge in a shared bathroom in an AirBnB with a bunch of friends. I use this to blend out my undereye concealer. 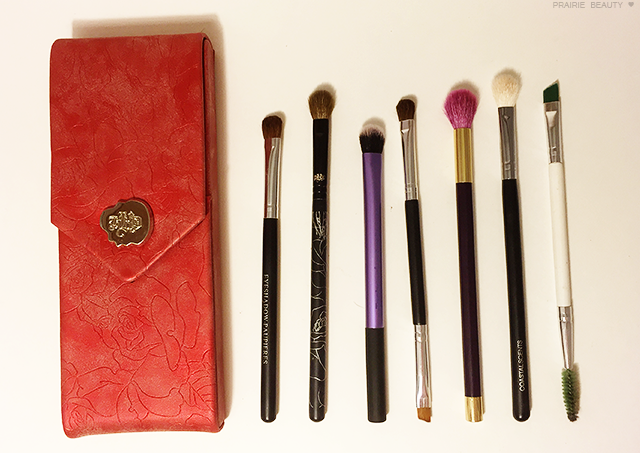 This case is perfect because it fits all of the eye brushes I want to bring perfectly - and there's not enough room in the brush section of my travel bag for all of these so it was necessary. I use this to pack product onto the lid and outer V. I LOVE this brush. This is a really soft blending brush so I like to use it in my crease as well as just above my crease to make everything seamless. This brush is the one I use to apply and blend out cream shadow and it makes it so easy. I use this to apply shadow to slightly smaller areas as well as to smudge shadow along the lash line for liner. I use this for my transition shade and to gently blend my eye looks out. This is my outer corner and crease blending brush. It packs a good amount of colour and simultaneously blends it out. I got this in a set at Superstore YEARS ago, but it's still a favorite because it has a very usable brow brush on the one end and a great spooly on the other. Like I said above, I'm trying to use a lot of samples that I have in my collection, so I grabbed whatever I could from my sample drawer for my skin and body care. 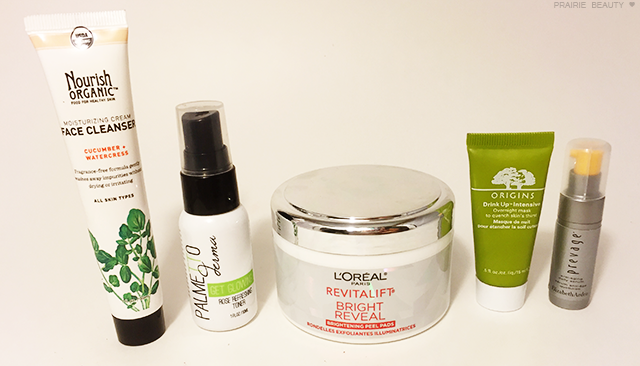 I don't actually know how I feel about some of the products, but now is a great time to figure it out, right? I'm LOVING rose water lately as a hydrating toner after my acid step, so this is small size is perfect for travel. I'm actually testing these out for review and I figure it'll be easy and convenient to just tuck enough for every night I'm away into a little ziplock type bag. This is one thing that I was actually really determined to bring with me, because air travel can be dehydrating to the skin and I will likely want to use this that first night for a little skin drink. I actually have used this once in the past and I think it's a fantastic serum, so that seemed like the one I wanted to grab while I was away. 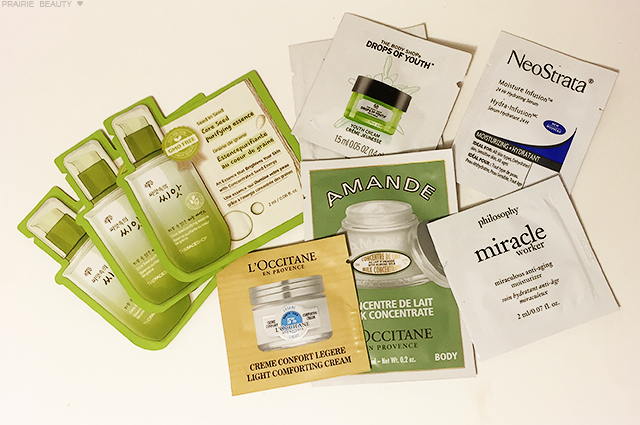 I also decided to grab a bunch of foil samples from my collection to take with me as well - because it seems like an easy, no brainer type of thing to use up foilies while on holidays..
For body care, I went almost entirely to my sample drawer and ended up finding pretty much everything I would need there. I haven't tried most of this stuff, but there are a couple that I can speak to! I love love love this body lotion and I was so glad that I had a sample of it because it's a great, light summer moisturizer that isn't going to feel too heavy in the heat and humidity. I'm mostly bring this along because it's SUPER hydrating and I tend to get dry on planes, so I'll use this on my hands as well as my feet and one weird dry spot I have on my ankle. First of all... The Travalo is SO HANDY because I can bring whatever fragrance I want without having to worry about having a glass bottle of expensive perfume with me. I decided to bring Hanai Mori Butterfly for two reasons - the first is that it's a really lovely summer scent, but the second is that it has a special place in my heart because the friend whose 30th birthday we're celebrating came to LA with me for my 30th birthday and I actually bought this fragrance on that trip. See? Special. I thought about photographing my toothbrush, toothpaste, floss sticks, and deodorant... but I decided that would be a little much. Don't worry though, those things ARE going to be going in my travel bag as well - I don't plan on being smelly with dirty teeth for my whole vacation!